Poetry, at its core, is a mystical endeavor: an encounter with the web of language that holds our consciousness. This is true even if the poem, on the surface, seems like a series of puns about Facebook, the least poetical of all possible media. 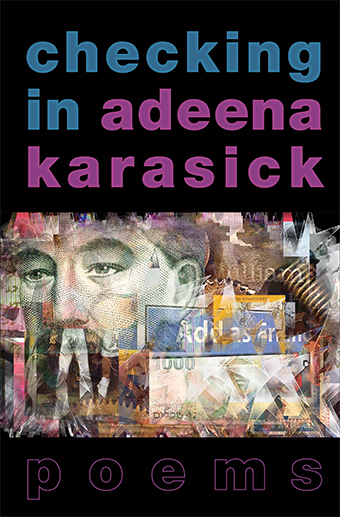 That, anyway, is the premise of Checking In, a new collection by Canadian-born New York poet, media artist, performer, and cultural theorist Adeena Karasick. The book’s central long poem, 36 pages in length, consists of faux Facebook statuses that weave together pop culture, literary references, philosophy, mysticism, and more—all in a mix of outrageous puns: “Ulysses is listening to Siren Song on Spotify” goes one line; “William Wordsworth is wandering lonely on iCloud” is another. Riffing on Homer’s Odyssey and William Wordworth’s I Wandered Lonely as a Cloud, the lines open up into something far great than witticisms. This is clear to anyone who spent days under the spell of limitless free music on Spotify, while imbibing deathly doses of interstitial advertising. While Wordsworth’s original poem creates a Romantic metaphor, using the natural world to describe the inner state of the poet, Karasick’s line links existential loneliness with the tangle of invisible technologies offered by a major corporation. The pun doesn’t seem all that funny, when you consider that the natural world is no longer a point of reference for us, as we use Apple-invented lingo to describe our most vulnerable emotions. What makes these literary puns poetry? In Kabbalistic thought, which Karasick, 53, cites in her epigraph, the world was formed through language, and so Hebrew letters are the primal energies of creation. In combining these energies into words, and in studying their patterns, one walks the line between linguistics and mysticism in an attempt to discern access points to the divine: the “state of ecstasy” referred to by medieval Spanish Kabbalist Rabbi Avraham Abulafia, one of Karasick’s inspirations. Read the full review on Tablet!